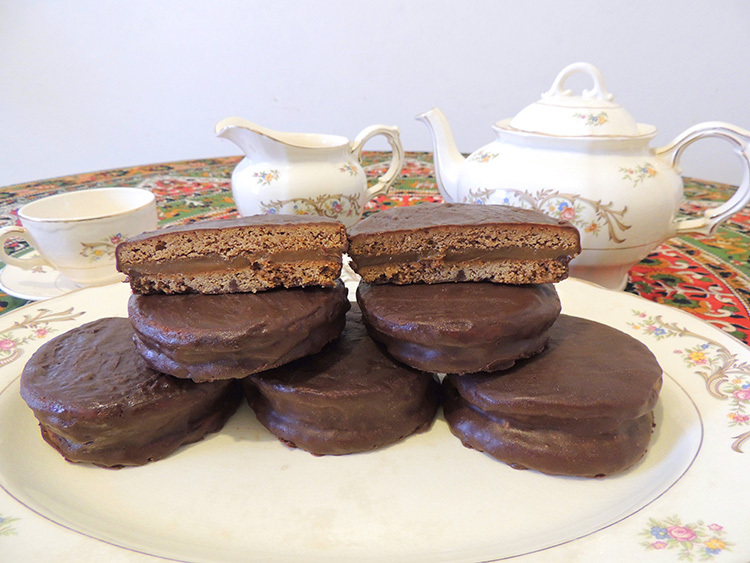 Famous Argentinian chocolate sandwiches dating back to the 19th century, it is also known as the national cookie! Whisk the butter with the sugar until the sugar has been mixed evenly. Then add the vanilla extract and honey. Dissolve the bicarbonate and baking soda in water and add this to the butter mixture. Sift the flour, cocoa, and cornstarch separately in a bowl. Pour the dry ingredients into butter mixture and knead it to prepare dough. Wrap in a plastic wrap and chill in the refrigerator (for at least one hour and up to 48 hours). Roll out the dough 5 mm thick and cut discs 6 cm in diameter. Place them on a tray with greaseproof paper or butter. Bake at 170 °C for 12 to 15 minutes. Once baked, allow the cookies to cool then take half the batch and spread them on a tray. Spread half the cookies on the less smooth side with 2 heaped tablespoons of dulce de leche (recipe below) or jam. Then add the chopped chocolate and melt together. Stir with a rubber spatula until chocolate is smooth and then remove from the heat. Coat the alfajores (cookies) with the hot chocolate and let it drip through a rack. Leave the cookies to set for 48 hours before eating. Mix warm milk with sugar in a pot. Add vanilla and baking soda after the first boil. Remove the pot from the heat, stir constantly with a wooden spoon to avoid lumps at the base. Return to a low heat for 3 hours, until mixture becomes thick and brown. This process will take time and requires patience, but if you want, you can put 3 glass beads on the bottom of the pot to prevent sticking and make lumps in the preparation. To test if the milk caramel is ready, put a little on a plate and if it sticks to your finger, it is ready! Refrigerate for a few hours before using it. “How does one reduce one’s desires? Eat only to the extent you require. If you serve yourself large portions of food out of selfishness, you will only end up with the sin of wasting food. The wasted food could have easily been served to another person who needed it. Hence, the first principle is “Do not waste food”. Food is God, life is God. It is from food that one gets life which sustains the body and mind. The gross part of the food taken gets excreted as stool. The molecular part of the food goes to the blood. The subtle part of the food goes to the mind. It can therefore be concluded that man’s mind is shaped by what he eats. The food that is being consumed today is primarily responsible for the demonic nature of man. There is no compassion, mercy, tolerance and love. Instead hatred, jealousy, attachment and other evil qualities have taken their place. The responsibility for this lies with the food that we eat. Therefore, the food that is partaken should be pure and sacred. Such food fosters good feelings. © 2016 Sathya Sai International Organisation . All rights reserved.